T-Mobile notched up their second win of the Tour of Spain on Friday after 2003 Ghent-Wevelgem winner Andreas Klier outgunned Dutchman Tom Stamsnijder (Gerolsteiner) in a spectacular two-up duel at the end of stage 13. Appropriately enough for a Classics specialist like Klier, the German took his win in weather more suited to Belgium in April than Spain in September – whilst dry at the finish, strong winds, hailstorms, rain storms and roads rendered lethal by the downpour had all combined to make the 176.4 kilometres between Hellín and Torre Pachecho very heavy going. In a textbook two-man duel, the younger, less experienced Stamsnijder launched his attack too early, burning himself out, whilst Klier?s steadier acceleration past the Dutchman was a classic example of how to outwit a stronger, but more impulsive rider. 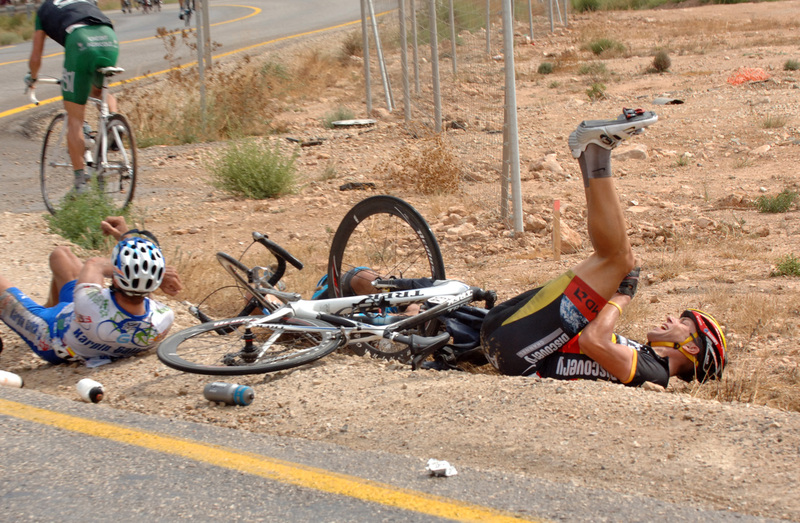 Stijn Devolder takes a tumble on stage 13. Photos by Graham Watson. Meanwhile, back in the main peloton, two large crashes shook up a bunch already soaked to the skin and which had risked their collective necks on a downhill from a third category climb awash with flood water. Fortunately there were no major injuries reported. Then to cap it all, Caisse D?Epargne used the crosswinds in the last 20 kilometres to try and split the peloton. Split it did, with Stijn Devolder (Discovery) one of the most affected. But the burly Belgian knew just what to do to bring back his segment of the bunch at least. One rider who did not have to put up with the Flanders-style weather was, ironically enough, Belgium’s number one Classics star Tom Boonen. Together with Davide Rebellin (Gerolsteiner), the Quick Step rider hotfooted it home on Thursday evening to prepare for the World Championships at home. He is nursing a suspected broken rib. All of the favourites finished in the front group of some 80 riders, thanking their lucky stars they had not been more seriously affected by the bad weather. Saturday?s ride through the constantly undulating, twisting roads of the Cazorla natural park could be much more of a challenge. 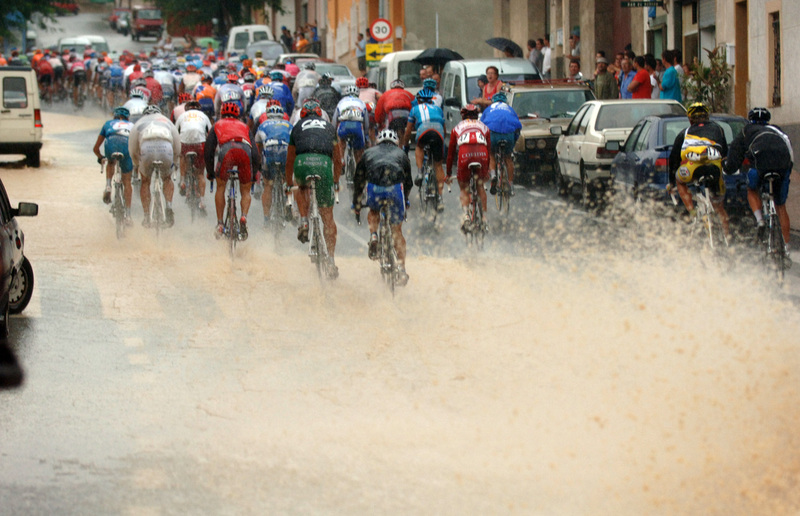 Rain in Spain falls mainly on the peloton. Photos by Graham Watson.